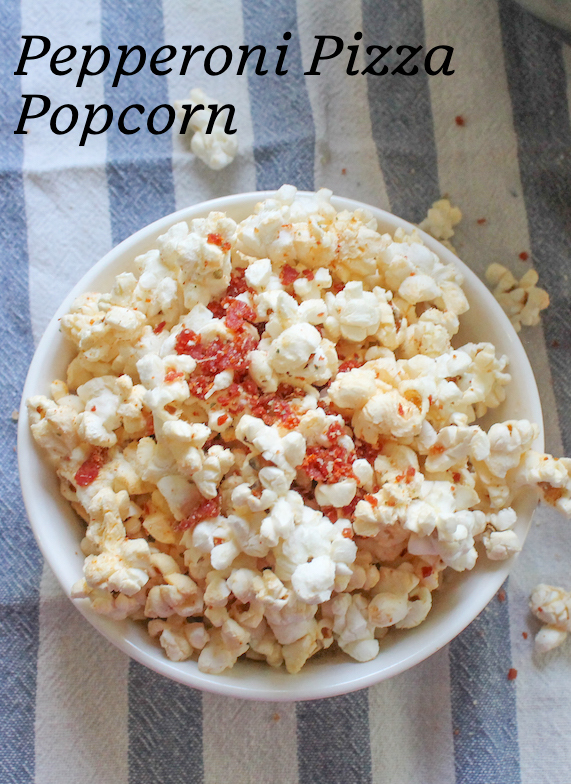 Pepperoni Pizza Popcorn is made with fresh popcorn kernels popped in the oil of fried pepperoni, plus ground sundried tomatoes, Parmesan and oregano. Perfect for your combo pizza/movie night. You know what’s hard to eat and type at the same time? Pepperoni Pizza Popcorn. And yet, as I sit here eating and typing, shining up my MacBook keyboard with every muted clack, clack, clack, I can’t stop dipping my hands into that big bowl. I find myself typing with only my right hand, so the left hand can still reach into that bowl. It’s not easy – the A and E are so far to the left! - but here we are. And it’s worth the trouble, I assure you. 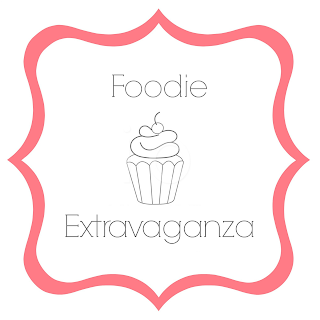 This month’s Foodie Extravaganza theme is popcorn in honor of National Popcorn Day on January 19th. 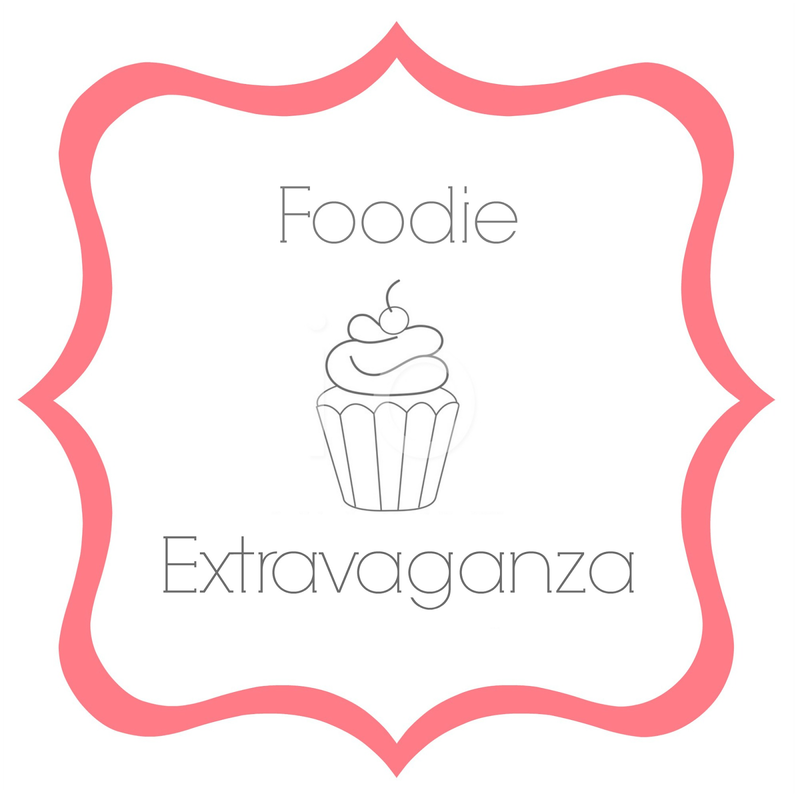 Now you will be prepared to celebrate with plenty of fun recipes! 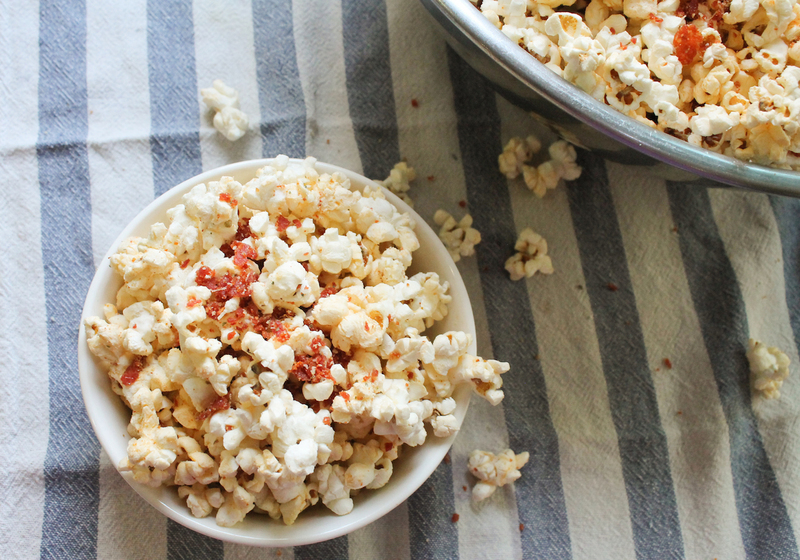 I gotta tell you about this pepperoni pizza popcorn. 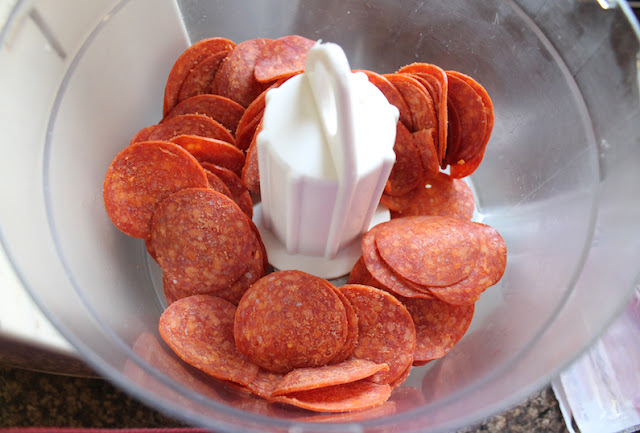 A lot of the pepperoni falls off and ends up at the bottom of the bowl. Which is not always a bad thing. 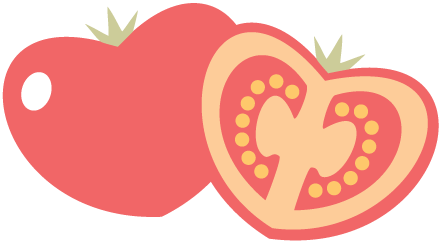 You can eat it by licking a finger and coating it with pepperoni. Over and over. And over. Every once in a while, I’d use a spoon and scoop to the bottom of the bowl and sprinkle the pepperoni back over the remaining popcorn. That helps too. 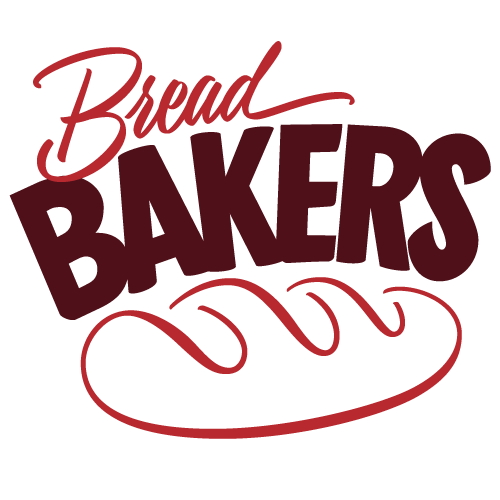 But the bottom line is that this stuff tastes so good, you won’t care. Ingredients – for a huge, I mean huge, bowl of popcorn. Put your sun-dried tomato powder, Parmesan and oregano together in a bowl. Stir well to combine and set aside. 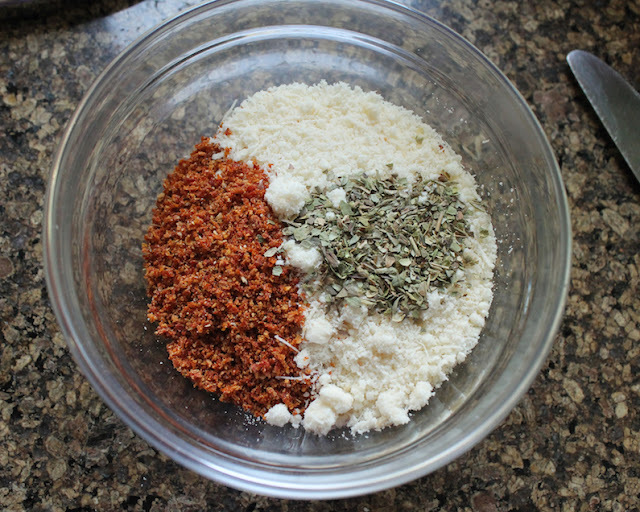 Chop your pepperoni in a food processor until it is in tiny bits. 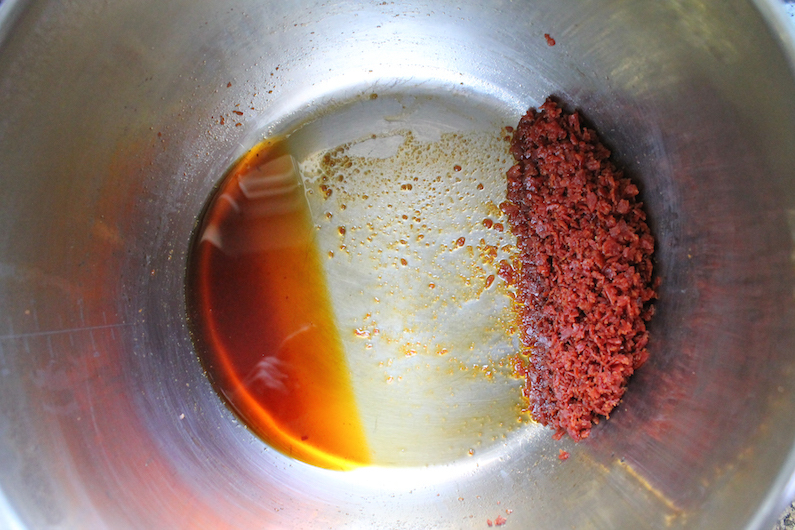 When the pepperoni is crispy, tip the pot to one side and leave it that way for a few minutes, so you can remove the pepperoni to a plate lined with paper towels and leave the oil behind. Pour the popcorn kernels into the pot. Give the pot a shake so they lay in a single layer. 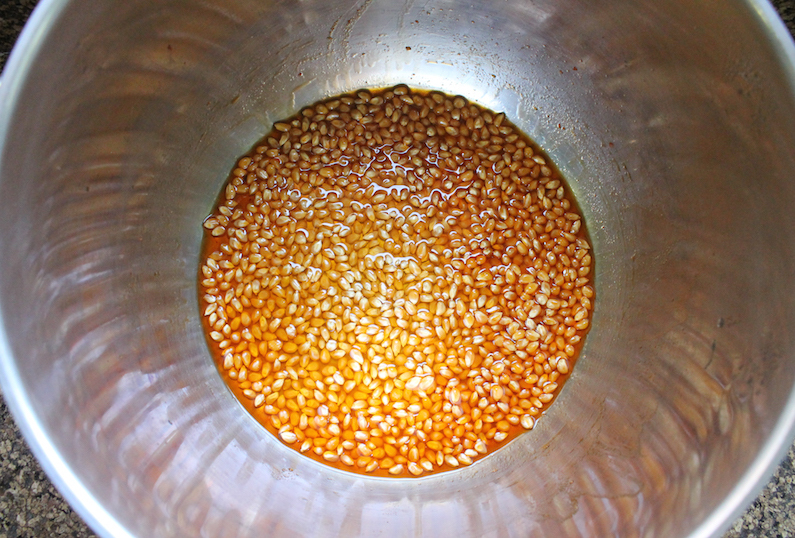 Add the extra 2-3 tablespoons canola oil so that all the kernels are coated in oil. 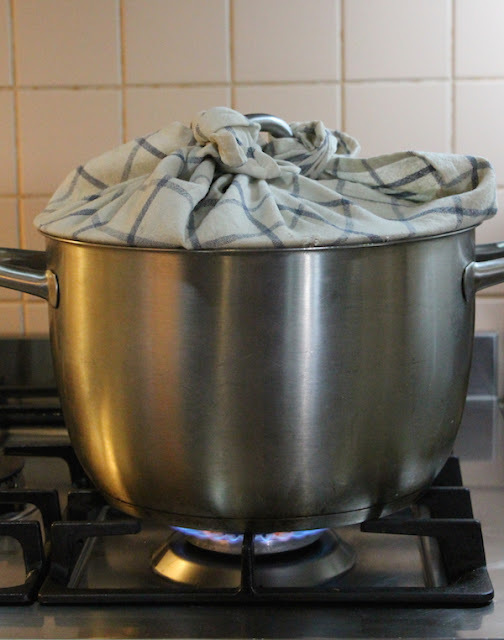 Use an old dishcloth to cover the inside of your pot lid, tying the ends around the handle on top. This towel will absorb the steam and keep your popcorn from getting soggy. Pop the corn, lid on, over a medium high heat until the kernels stop popping. Shake the pot occasionally to send the unpopped kernels back down to the bottom. Remove from the heat and tip the popcorn into a large bowl. 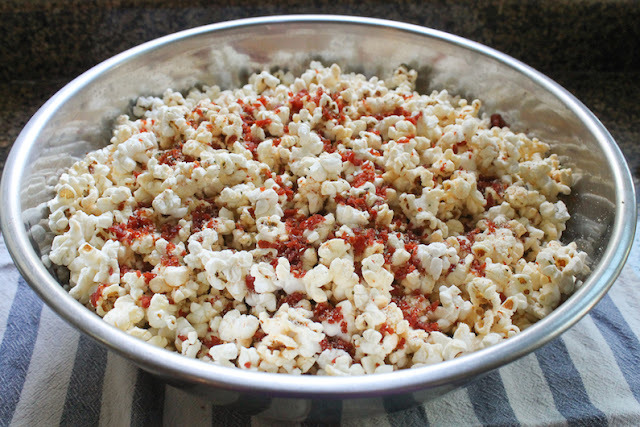 Sprinkle the popcorn with the sun-dried tomato powder, Parmesan, oregano and crispy pepperoni. 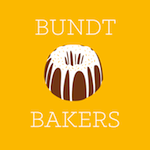 Many thanks to our host this month, Camilla of Culinary Adventures with Camilla. 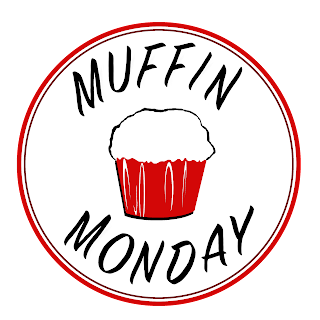 Check out all the great popcorn recipes we have for you!